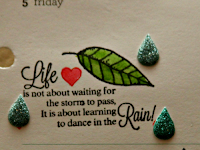 Welcome to the August Inspiration Challenge over at Paper Sweeties! 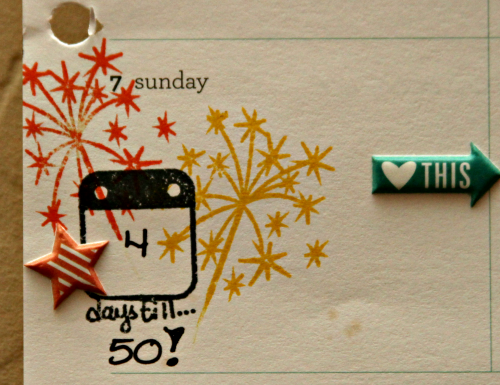 It's going to be a fun month at Paper Sweeties this month because it's our 4th Birthday Party Celebration! Lots of special things going on... more information on that later! 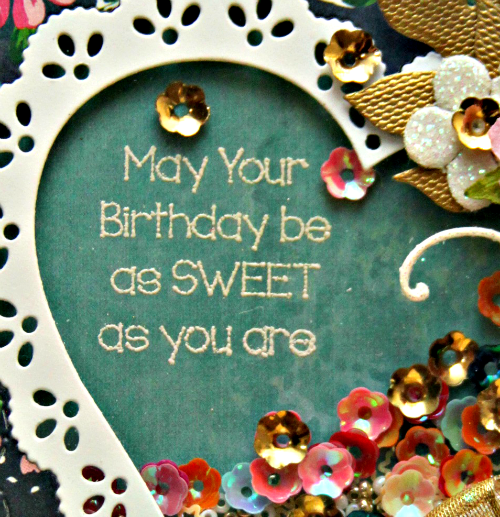 And for this special birthday month Inspiration Challenge, the winner will receive a $100 gift certificate for Paper Sweeties Sweetness! You heard me right... $100!!! Now that should be something to inspire you!! Always the colors...lol... but I also loved that tall tower of sweet treats and the flowers! I wanted to really have the feeling of a party so I used quite a few banners to decorate the room including that pretty and delicate heart banner from Sweet Borders Sweet Cuts and the triangle banner from Birthday Banners Sweet Cuts. 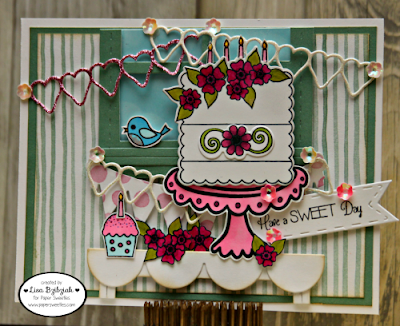 I mashed up the cake from Party Time Stamp Set and Sweet Cuts and the plate from the Eat Cake stamp set to create my tower of sweetness. I used the Sweet Borders Sweet Cuts to create the table as well as my sentiment banner. Love that adorable little cupcake and cutie pie birdie from the I Love Summer Stamp Set and the pretty flowers from the Party Time Stamp Set! The sentiment from the Sweetie Pie Stamp Set seemed perfect! That one is one of my favorite go to sets for a "sweet" sentiment! I added a few more candles to my cake from the I Love Summer set and the flower and flourish decoration is in the Party Time set. Had a lot of fun creating this one and I can't wait to see what inspiration you get from this beautiful photo! 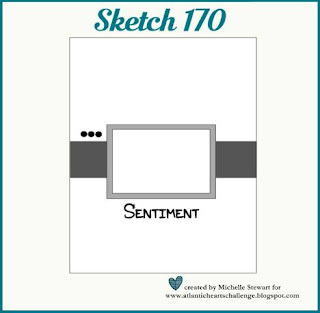 Now check out what the rest of the Design Team has made for you and then play along! 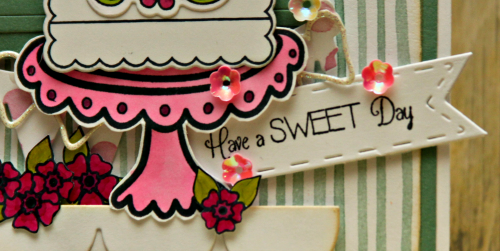 You could win some Paper Sweeties goodies! 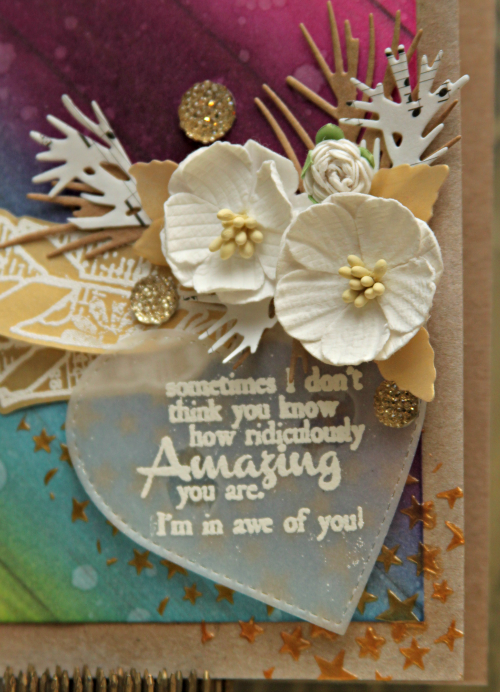 And welcome Lilian Forsyth to the team and so Happy to have Elizabeth Hart as our guest designer this month! 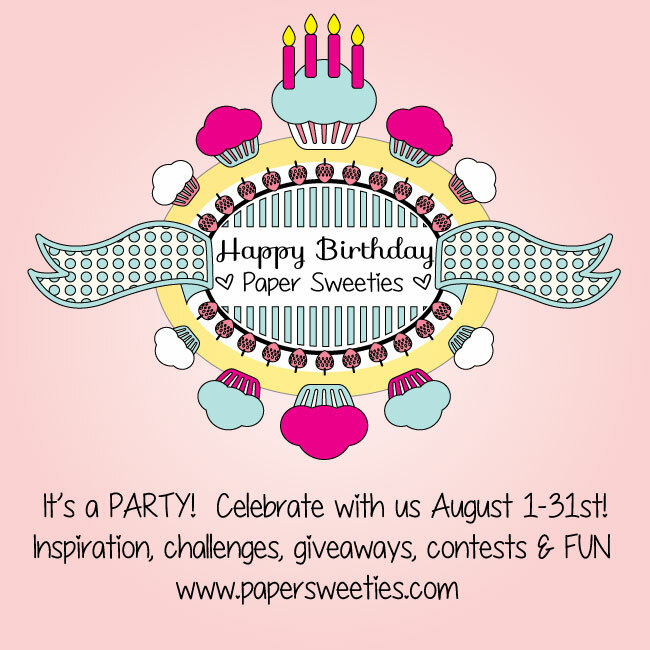 Come back on the 10th and celebrate Paper Sweeties 4th Birthday with us! 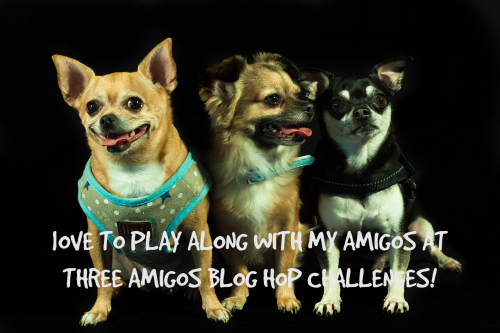 We've having a Blog Hop and there will be prizes and fun will abound! AND! 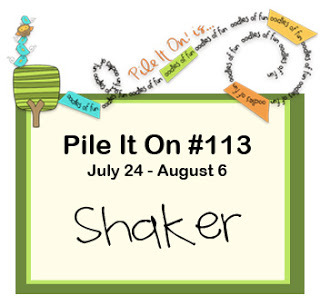 Have you checked out the Pile It On Challenge that goes through August 6th? 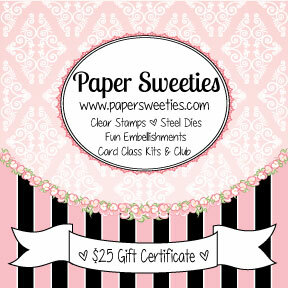 Paper Sweeties is sponsoring and you could win a $25 gift certificate! 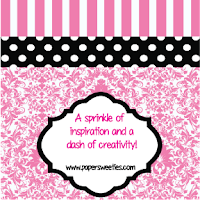 AND Paper Sweeties is sponsoring the next Pile It On Challenge too! Get more details at my Pile It On Challenge Post here! As you can see... it's quite the party around here this month and there will be lots of opportunities to win stuff so come back often! 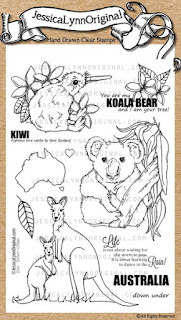 Welcome to the launch of an awesome new stamp set by JessicaLynnOriginal, Down Under clear stamp set! 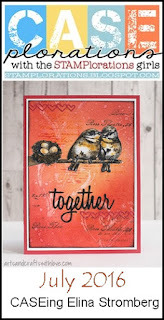 This is one beautiful set of stamps created by Jessica and you are going to love it! 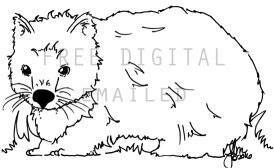 Buy this beautiful set today and you get this free Wombat digi to go with it! 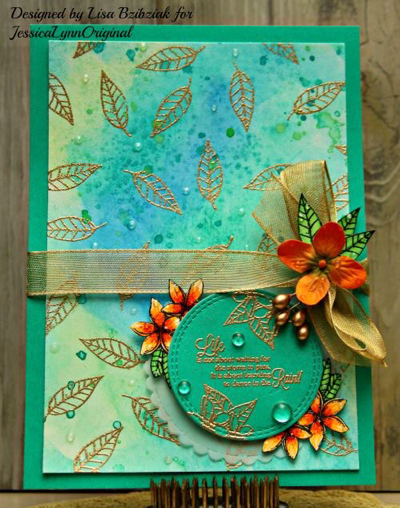 For this one I started with a watercolor background I had made earlier and stamped the leaf in versamark all over in a random triangular pattern... Making sure to turn it in various ways. Also because it was hard to tell where is stamped and not stamped, I stopped and heat embossed with gold powder after about four or five stamps so I could be sure to get the right spacing. Then I stamped the sentiment which I love on a die cut circle in gold. 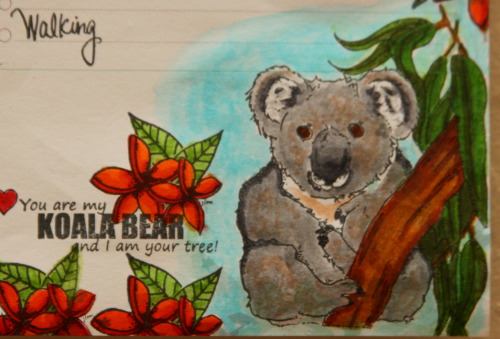 I also stamped some of the pretty flowers that are on the Koala sentiment and some extra leaves on white paper and colored them in with my Copic markers. After I had it all assembled I added some raindrops all over the piece using liquid glass and a few clear droplets from Pretty Pink Posh, gold ribbon, and I just happened to have this pretty paper flower in my stash and these cool stamens from Fun Stamper's Journey. 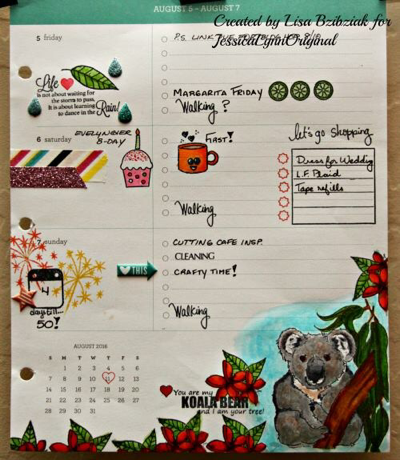 Isn't that koala just the cutest?? I used my Zig Real Brush Markers to give him and the flowers a watercolor look. 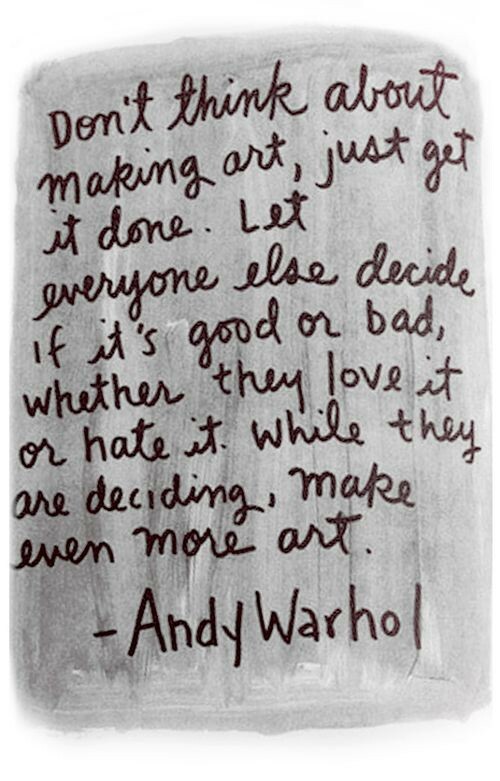 Love that sentiment! 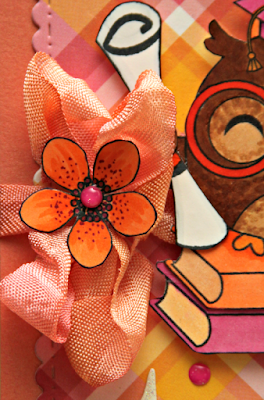 And basically for all the flowers on all my projects today I used the flowers that are in that adorable sentiment! I might add that since I started to really use my planner and decorate it up I invested in another planner set from Jessica and I'm loving it! I cut out the circle card base on my cricut. 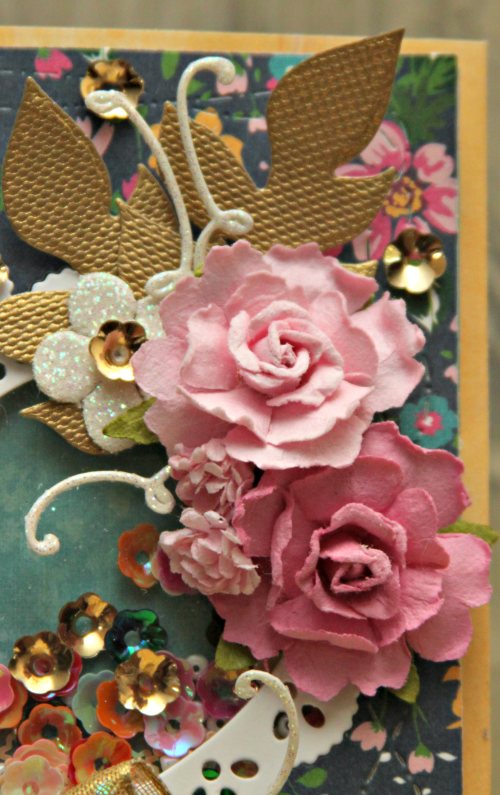 Then in much the same way as my first card I stamped and embossed in gold the pretty flowers from the sentiment stamp and then colored them with my Zig markers. 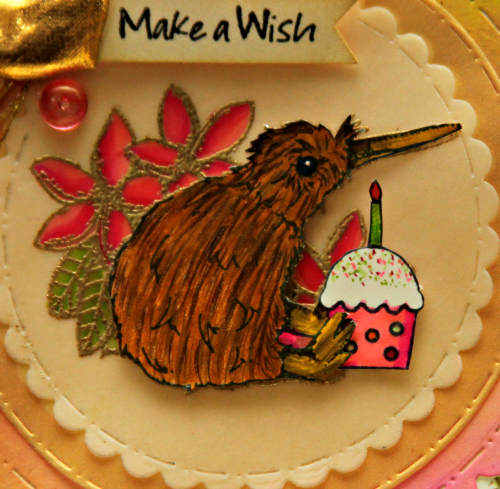 This Kiwi ... He's got my heart all aflutter... Lol! I used my watercolor markers again for this guy. I stamped him (along with the flowers that are on this stamp) onto vellum with Versamark and embossed it in gold. Then I stamped him again with black memento ink onto white Copic friendly card stock and cut just him out without the flowers. 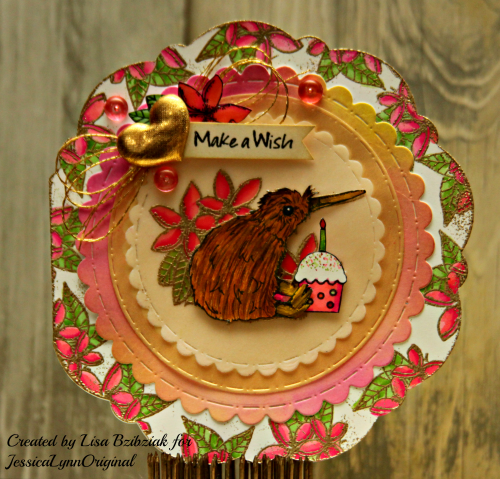 Then I colored the vellum flowers and the card stock Kiwi with my Zigs and layered him on top with some foam tape for dimension. My favorite part is when I snipped between his cute little feet and inserted his birthday cupcake. 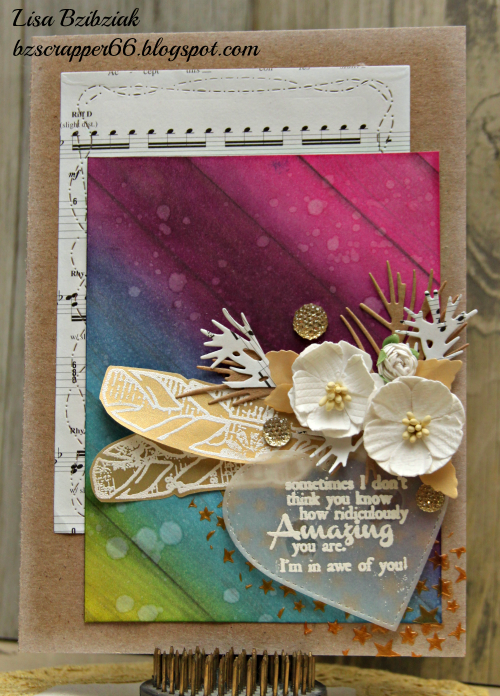 I stamped, colored and cut an extra flower and leaves for my cluster. The sentiment is from another of Jessica's stamps. 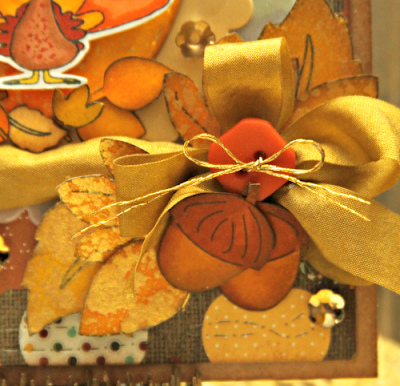 The gold fabric heart is from Fun Stampers Journey (I sure hope they still have these. Lol). The gold thread is from the jewelry department at Michaels. The pink droplets are from Double Click Skittles. That's what I have for you today! Thanks for hangin in!! 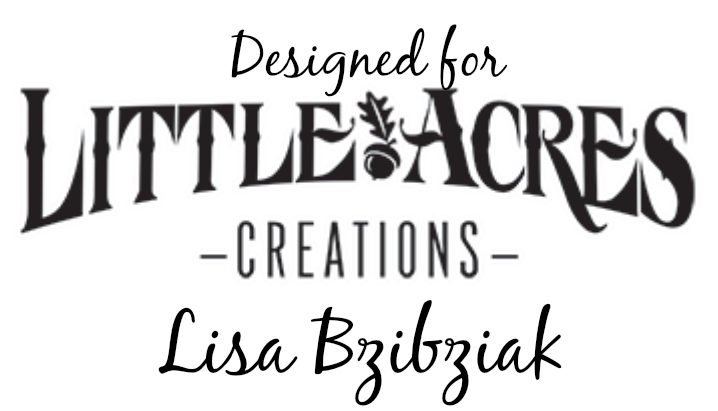 Now please be sure to check out all of the design team creations because they are all pretty awesome! You can start at the JessicaLynnOriginal Blog here! Thanks so much for stopping by today!! Be sure to come back on Monday for some more fun! So very awesome! 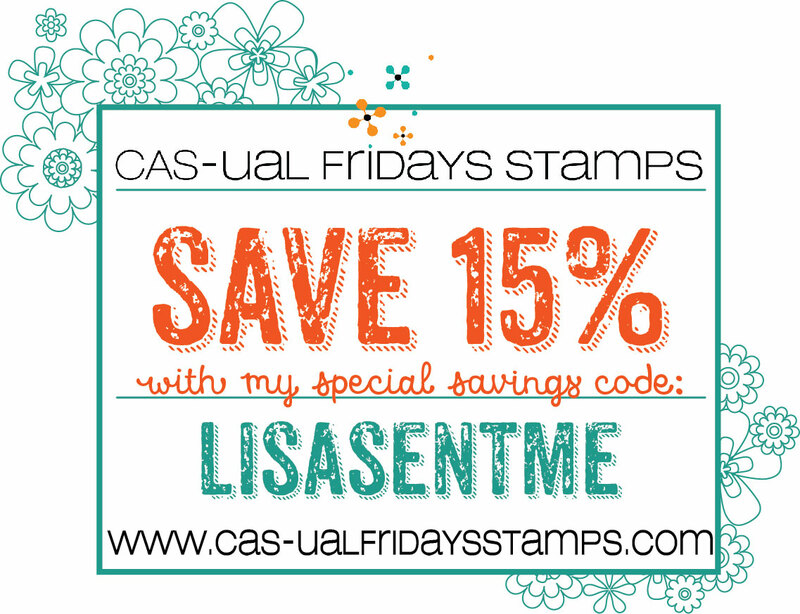 This week I received in the mail the Custom Stamp I ordered from The Cutting Cafe Shop and I am in love with it!! So you'll have to forgive me for the Very Fall theme, however the set was just sitting there staring at me wondering why I hadn't cracked it open yet... so... I did! 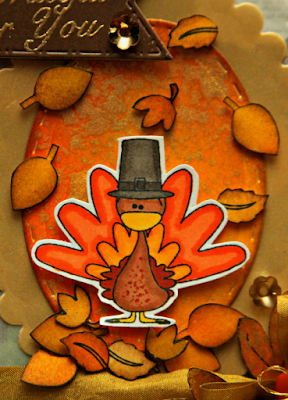 I just love this little gobbler and those leaves... she added them to the set in two sizes at my request and I'm so happy I was able to do that! 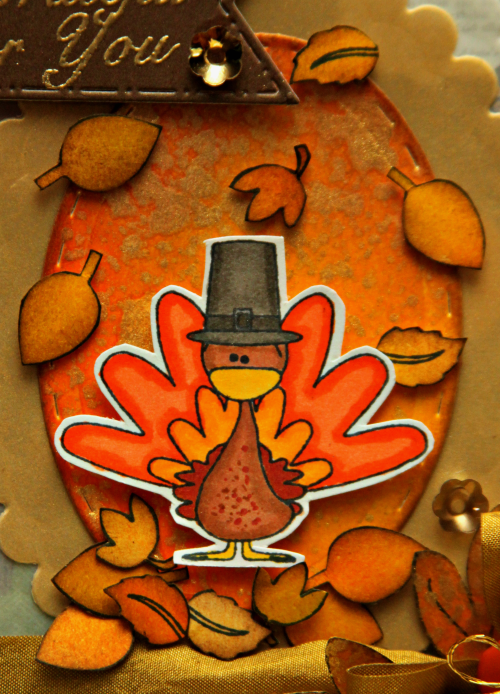 The acorns were also in one of the files and she put together a few sentiments for me too... I will add links to the files I used images from at the bottom of this post. Love those acorns... and yes.. I went a little heavy with the Gold Color Shine on both my leaves and my background, but it turned out to be a happy accident.. I don't mind at all! But there are so many more!! 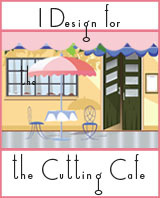 AND you don't just have to choose images from the Cutting Cafe website! If you have a set you must have and can't find anywhere... contact Regina and have it made just for you... yes... you can get a return address stamp or a Made By, but you can also get so much more! Start here! Thanks for stopping today and come back tomorrow! I'll have something more for you! 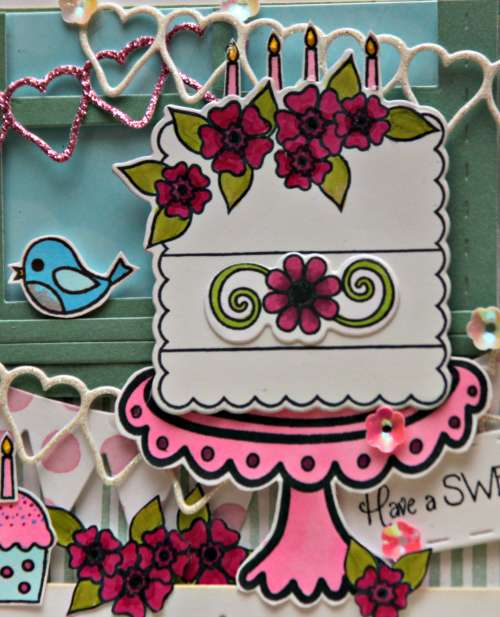 Paper Sweeties and the Pile It On Challenge! 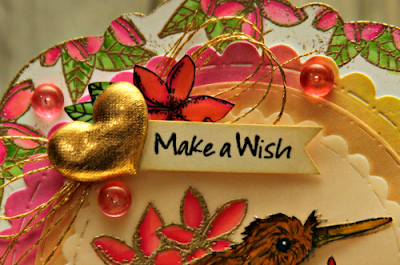 Paper Sweeties is the sponsor for this challenge and the next over at Pile It On! This time around it's all about the shaker and I'm playing along. 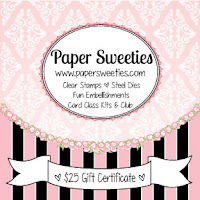 You should too because you just might win a $25 gift certificate to spend over in the Paper Sweeties Shop and you can get a whole lot of Paper Sweeties goodness for $25! 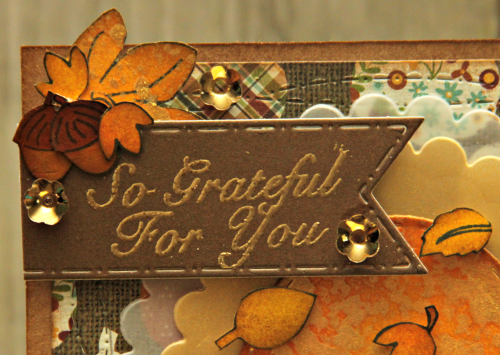 I used a lot of my favorite Paper Sweeties Dies and that cute sentiment stamp on this one! That heart doily from the With Love Sweet Cuts die... what can I say... I LOVE it. When you cut it you get the lacy outline and the inside heart at the same time. I used it to cut out my window for the shaker from the floral paper and then cut one again in white to add back the lacy outline and I LOVE the way it turned out. I must admit... I planned this one in the middle of the night...lol! 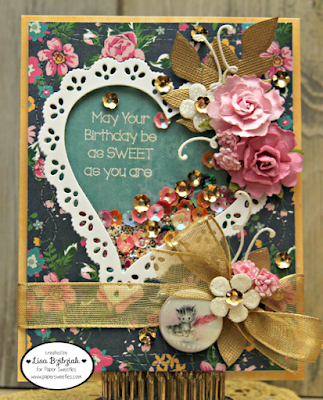 AND I have two pretty cuts leftover ... the heart and lacy heart in that floral that I can't wait to use!! I think you might see those sooner than later. And those beautiful Paper Sweeties flower shaped cupped sequins... love this mixture of Cupcake Sprinkles with the Gold.. and I threw in some micro beads for good measure. The sentiment is from the Sweetie Pie set... lots of cute sentiments on this one as well as a couple Sweeties outfits that are adorable!! Definitely one of my faves! I love to use those large leaves from the Bee Happy Sweet Cuts and why of course I used my favorite squigglies from the Sweet Borders Sweet Cuts! 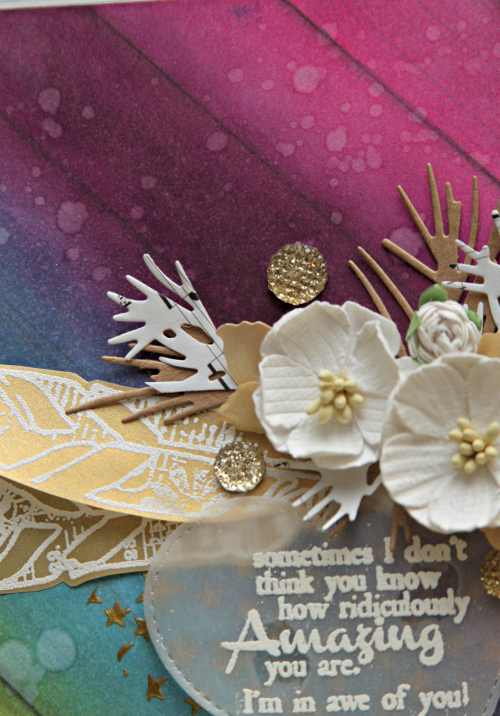 And for this cluster I added some of the smaller leaves from the Pretty Posies Sweet Cuts and some more squigglies. I also thought this was the perfect place to add one of my cute little kitty badges that I got from Lori at Choux Choux Paper Arts. 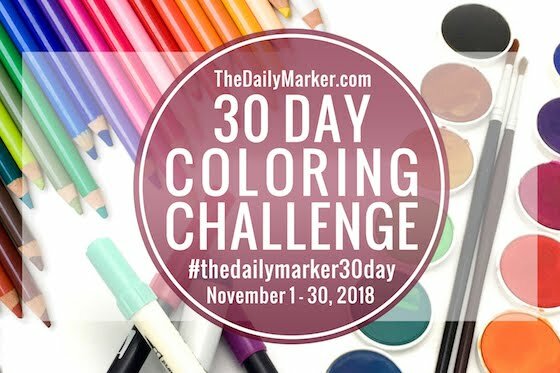 Thanks so much for stopping by and don't forget to hop on over to Pile It On and check out all of the awesome artwork and play along! 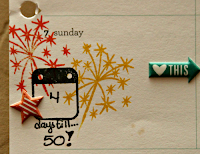 And don't forget about the celebration in a few days! 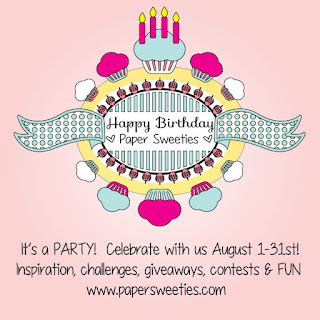 Paper Sweeties turns 4 in August and we are celebrating! 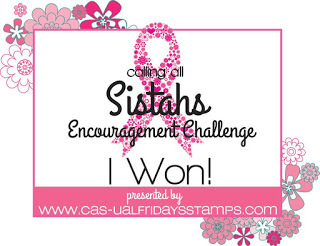 Come back on the 1st for some Inspiration Challenge inspiration and join the party! For this week's sketch, I needed a grad card for my niece that graduated in NY but we're celebrating it now because she's out for a visit. 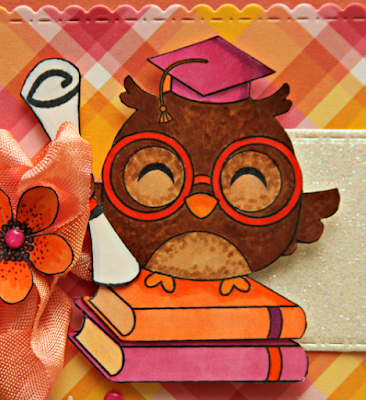 When I saw the new Back To School digis over at Craftin Desert Divas and this cute little School Teacher Owl I knew it would be perfect! 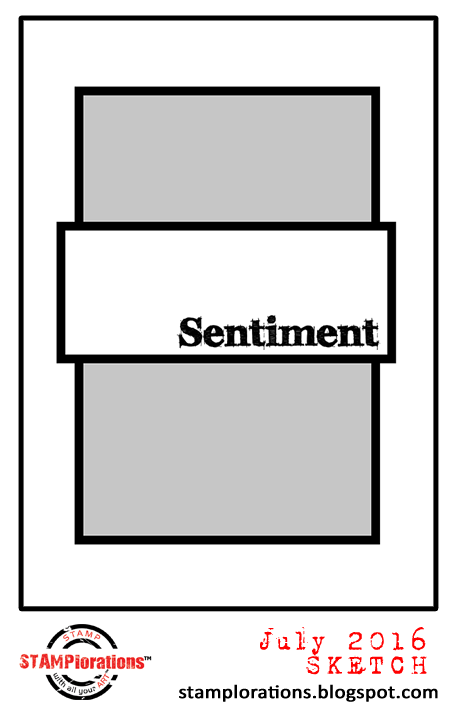 I just cut her out and did away with the chalkboard and added an extra book (in my usual style I had cut two images. This time I cut one slightly larger than the other that worked out for both adding a book to the stack and when I inserted the scholarship roll for the pointer she had in her hand it was nice to have the extra wing tip in a larger size to cover up the paper piecing. You can see it here because the ribbon kind of hides it, but I know it's there and it makes me happy. Isn't she cute!!!??? I decided instead of the usual black hat, she would have wanted a cute pink one. 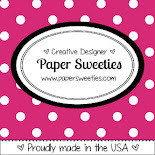 Isn't that pretty pink plaid paper just perfect?? It's from the Lawn Fawn Perfectly Plaid paper pad. 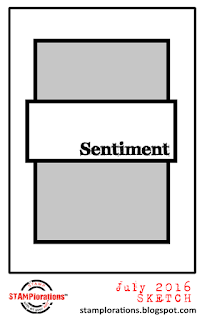 And the CDD Word dies and Tiny Sentiments set... I think perfect! 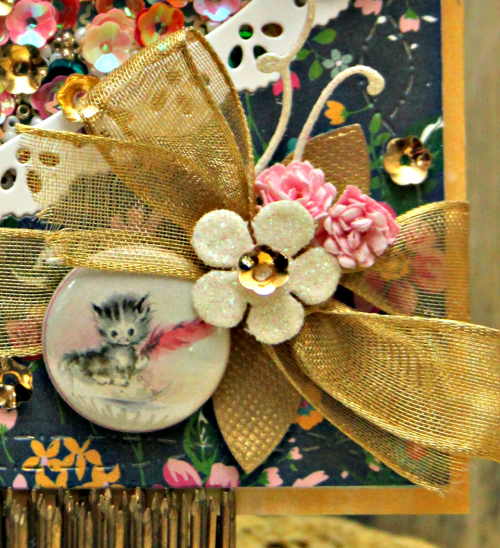 The banner and the little bracket sentiment tag here are from the CDD Pocket Pieces Hello Dies. That's it for me! Thanks so much for stopping by and head on over to Atlantic Hearts Blog and checkout the artwork and play along! 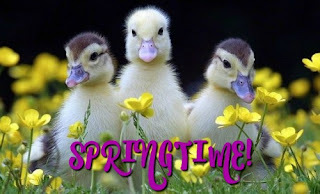 It's a great week to start! 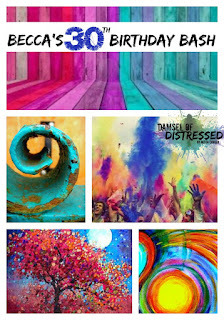 So it's probably obvious what my inspiration was... that beautiful colored woodgrain. I got out my distress inks and started sponging it on and blending and I went from stressed out to ecstatic in about 20 minutes. I am not expert with the distress inks, but I am learning and I am very happy with the way this background turned out. 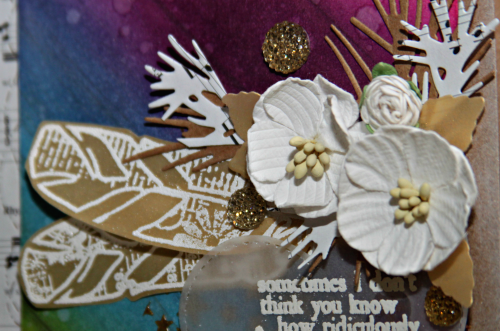 I started with the woodgrain paper from the CTMH Happy Times packet which is a very light gray and I can't stop oogling this rainbow of woodgrain. After I was all done, I sprayed it with some Ken Oliver Liquid Metals that I had mixed in water which gave it a nice shimmer that you may or may not see here, but it's really pretty in person. And then I splattered on some water drops. I'm also playing along with the Stamplorations Them and Sketch Challenge for July (theme is Stars and Stamps and I'm playing along with both Theme and Sketch this time), Stamplorations Never Ending Anything Goes Challenge, and the Stamplorations CASEplorations Challenge (it was the beautiful ink blending and water droplets that got me on this one). So let me say... 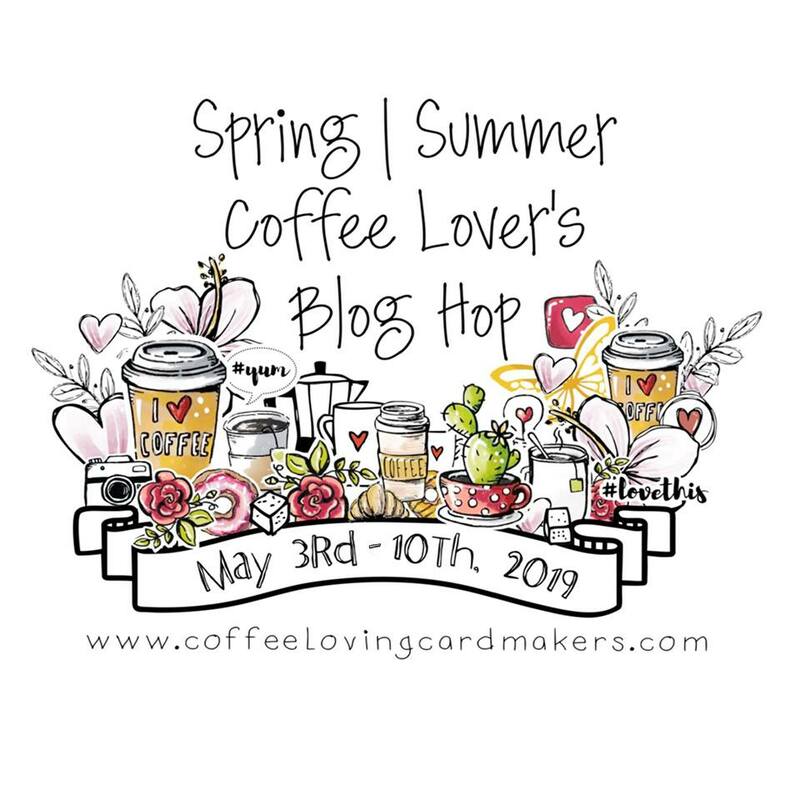 I "met" Becca during the Coffee Lovers Blog Hop and have been greatly inspired by her creations over the last couple years. Soon after she had her Damsel of Distressed Blog Hop for Domestic Violence awareness and I joined in for that one too. 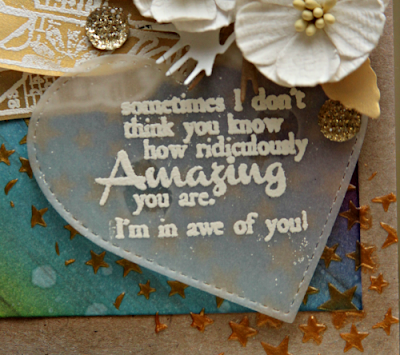 Not only is she so talented in the making of beautiful cards and mixed media artwork, but she also is a designer of stamps for Stamplorations, and I think I might have all of her sets... and this sentiment is from one of them... it's a beautiful group of sentiments called Strong Women. 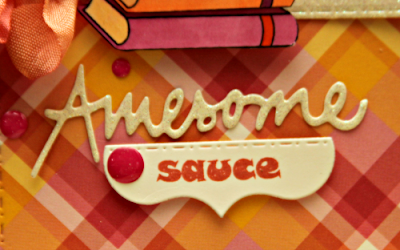 And a closer look at my yummy background... I do love it! Thanks for stopping by and be sure to hop over to Becca's and say Happy Birthday and play along!! What inspires you about her photo?? 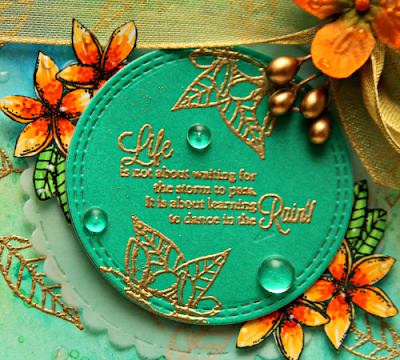 Today the Design Team inspiration on Facebook is all about the new Scoops Stamp Set. 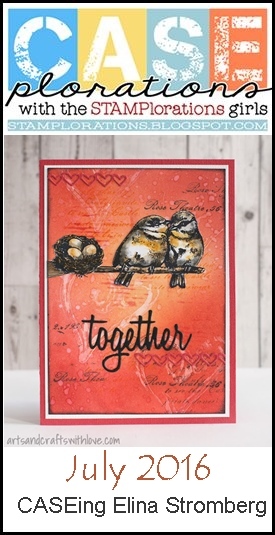 I was lucky enough to get a chance to play with this one and I just LOVE how fantastic it works along with so many of the digi images available in the CDD Shop. A list and links to all of the CDD products I used on this project is at the end of this post! I started this one by using the Picture Frame dies along with my Fancy Frame dies to create the window to my ice cream shoppe. 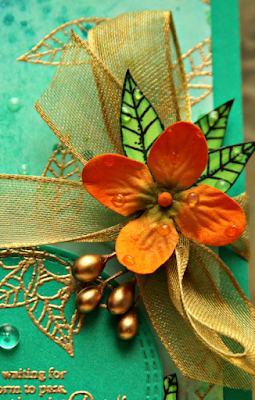 I layered it over a piece of cardstock that was embossed with a brick embossing folder. 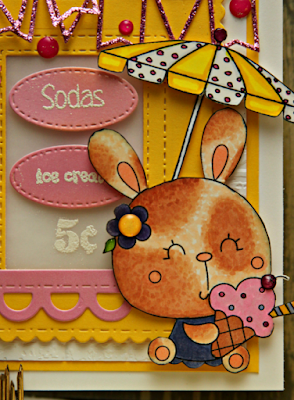 This cute little digi is called Bunny Loves Ice Cream ... isn't she adorable!!?? 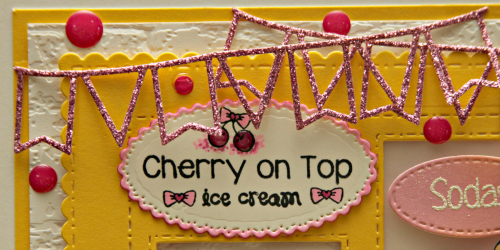 I added the cherry on top of her cone from the Scoops set. I placed vellum behind the large window so I could mount my signs for the shoppe on it. I heat embossed the signs in white and then added the price right on the window... um... I'm glad ice cream isn't only 5 cents because I think I'd buy way too much! The words are from the Scoops stamp set as well as the umbrella. There are oval signs on the set, but I used my Fancy Stitched Label Dies to cut my signs instead. 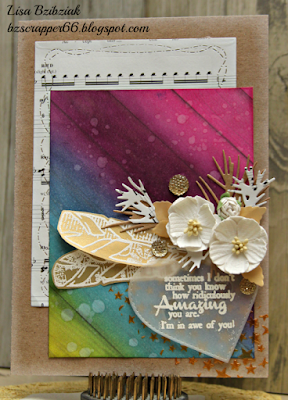 That pretty scallop die under the window is from the Pocket Pieces Hello Dies. I created my Shoppe's sign with another oval from the Fancy Stitched Label Dies and then stamped the words, bows and cherries from the Scoops set. And that adorable little critter is from the Scoops set too.. Is she gonna sell that cone or eat it? I'd eat it before it melts. 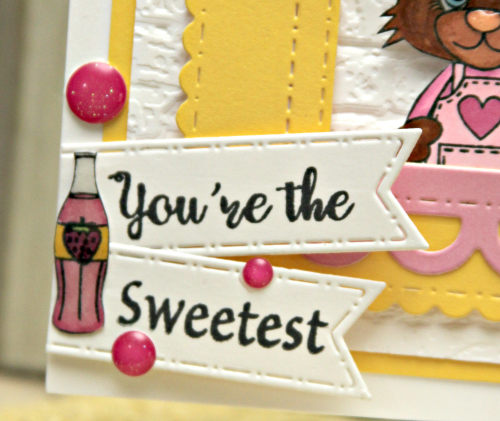 I used Flag Banner Dies and stamped the sentiment from the set and decided to add a little bottle of strawberry soda... they sell Soda at this Shoppe too of course! 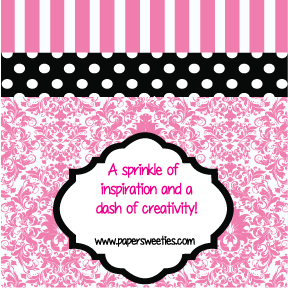 And since this is the grand opening we've put up some sparkly banners from the Party Dies and threw around a few Doodlebug Sprinkles in Bubblegum colors. Thanks for stopping and taking a peek today! 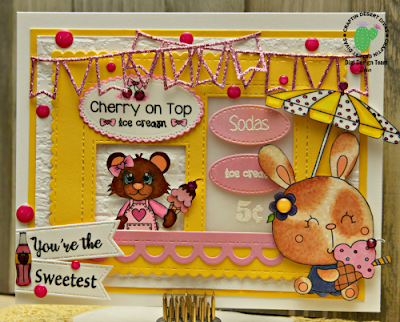 Now head on over to the CDD's Facebook page to hop along with the Design Team and check out all of their wonderful creations! And you might even win something while you're at it! 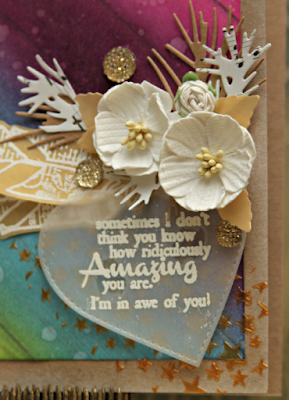 The Cutting Cafe Inspiration Week XL! Jessica Lynn Food & Fitness Release! 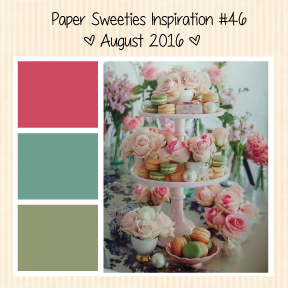 Paper Sweeties July 2016 BLAST FROM THE PAST! Craftin Desert Divas July Release-Scoops! 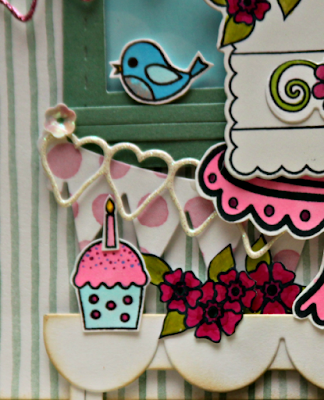 It's A Party Over At The Cutting Cafe Shop! JessicaLynnOriginal Day 4 of Christmas in July! Happy 3rd Birthday to Stamplorations! JessicaLynnOriginal Day 3 of Christmas in July! Jessica Lynn Original Christmas in July!